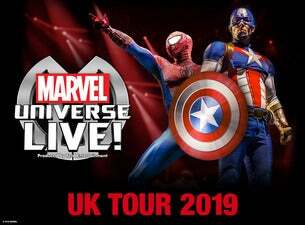 Motorpoint Arena Nottingham - NottinghamMarvel Universe LIVE! The O2 - LondonMarvel Universe LIVE! Following a hugely successful first tour, Marvel Universe LIVE! is back with a brand new show featuring more than 20 of your favourite marvel super heroes and villains for 2019. In this all-new production, produced by Feld Entertainment, Spider-Man, The Avengers and the Guardians of the Galaxy will join forces with Doctor Strange – the master of the mystic arts – as they do battle against Loki. Fans will witness cutting-edge special effects, pyrotechnics, and impressive 3D video projection mapping in this completely new thrilling adventure. With aerial stunts, martial arts and daring motorcycle skills, fans of all ages will be immersed in the Marvel universe in a show unlike anything they’ve ever seen before.